Manhattan House, one of the first "White-Brick" buildings to be erected, is one of the most influential post-war buildings in New York City, presenting a clean, neat — almost Spartan – appearance, contrasting with the historical styles of earlier periods and the Art Deco stylizations of the 1920s and 1930s. Designed in 1950 by world-renowned architect and leading proponent of modern design, Gordon Bunshaft of the firm Skidmore Owings and Merrill, Manhattan House was designated a city landmark in 2007. The innovative setbacks of the building allow for elegant floor plans, multiple exposures and expansive views throughout the building. Composed of concrete, with a white brick façade, large windows, and cantilevered balconies with glass railing, this modernist icon has been thoroughly renovated with infrastructure, finishes and amenities that both respect its heritage and make it ideal for your contemporary lifestyle. 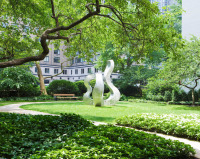 Manhattan House enjoys two porte-cochere entrances leading into the grand, glass-enclosed lobby overlooking one of the largest private gardens in the city, with two sculptures by Dutch-born Hans Van de Bovenkamp. Additional amenities include a 24-hour doorman; full-time residence manager; five-star hotel concierge service; on-site valet parking services; the newly-renovated fitness room, an Exhale Mind Body Spa on the rooftop; a yoga studio; a children’s playroom; bicycle storage; and a rooftop terrace housing the Manhattan Club, with 10,000 square feet of interior and exterior entertainment space. Its Lenox Hill neighborhood, which is the southernmost part of the Upper East Side, possesses a young, fashionable, urban demographic. Lenox Hill is named after Scottish immigrant Robert Lenox, who farmed 30 acres of the area in the early part of the 19th century. Today, Lenox Hill is known for its upscale shops and restaurants, from Bloomingdale's as its centerpiece to the other notable boutiques and restaurants on Lexington and Third Avenues. When you’ve had your fill of shopping and dining, Central Park is just a few blocks west, for all sorts of outdoor activities, from concerts to playgrounds to sun-bathing. And when you want to go further, you’ll be a five-minute walk from the 63rd street subway station (with the F, Q, and R trains) and 68th street subway station (with the 4 and 6 trains), both on Lexington Avenue. Former Governor Hugh Carey, Grace Kelly, Jackie Robinson and jazz legend Benny Goodman all made their homes at Manhattan House. Will you?